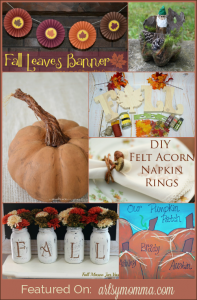 Fall is in the air…… What better way to transition into the changing of the season than a couple of easy Fall leaf projects to decorate the home with! 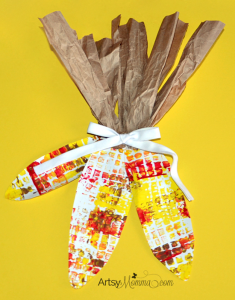 First, we will show you how to make multi-colored coffee filter leaf suncatchers. 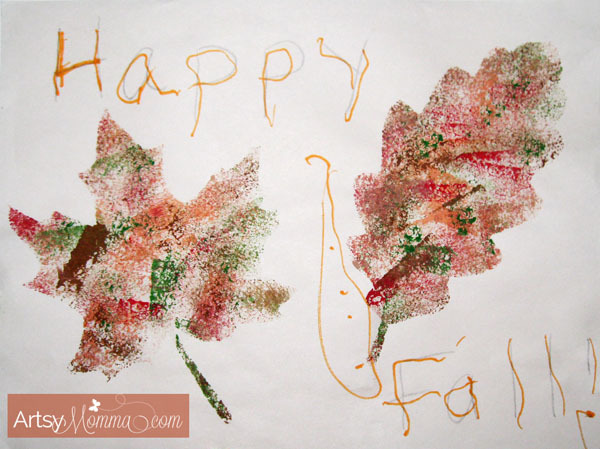 Then, we are sharing a simple Fall painting idea that’s perfect for toddlers and preschoolers – sponge painted paper leaves. 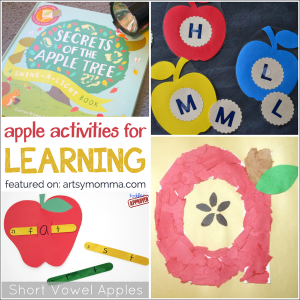 You can use the same leaf templates for both art projects. 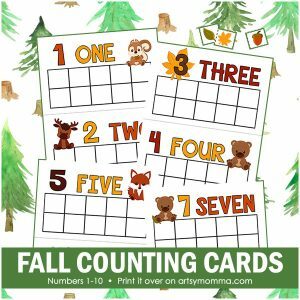 This post was originally published on Nov 21, 2011, and updated on August 28, 2018. 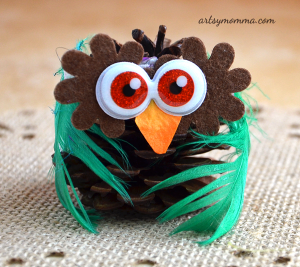 This coffee filter craft is perfect for beginning art projects for toddlers and preschool aged children. They will be mesmerized watching the markers bleed together to create beautiful multi-colored coffee filters. 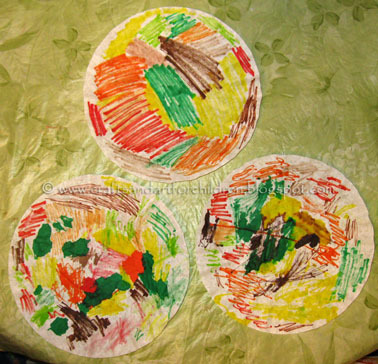 First, color the coffee filters with markers. There’s no right or wrong way to color them. Next, place them on a baking sheet, tray, or shallow dish. Spray with water. Kids really love this part! 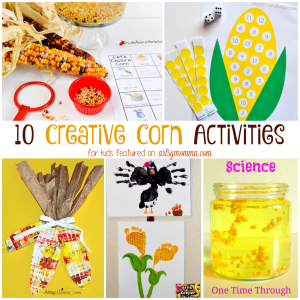 Set aside to dry or place in the sun to speed it up a bit. 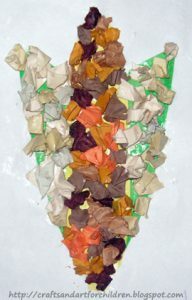 Once the coffee filters are dry, make leaf shapes from them. 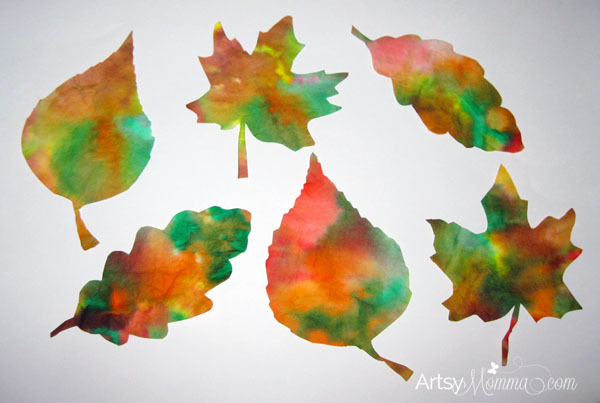 I used these leaf templates as stencils. 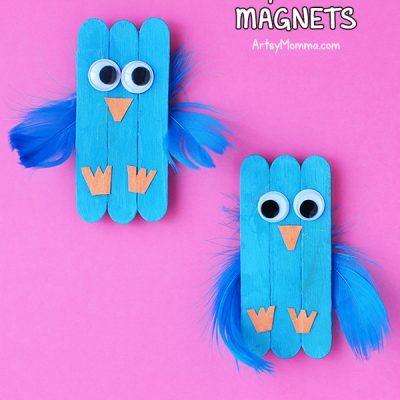 Cut them out and then trace one onto each coffee filter. 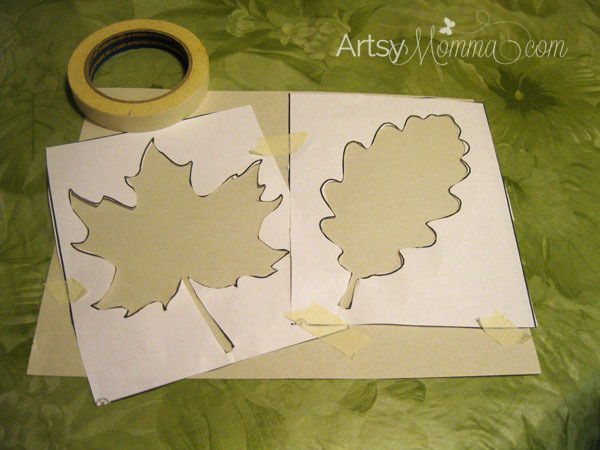 Finish by cutting the traced leaf shapes. Finished coffee filter suncatchers, ready to be displayed in the windows for all to see. Here are the finished suncatchers before hanging them in the window. They turned out very colorful and pretty! 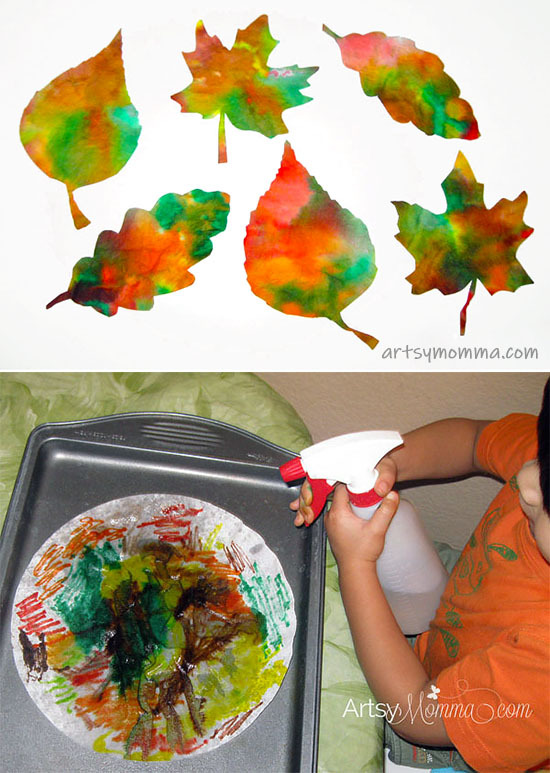 Another super simple Fall art project for younger kids is this leaf sponge painting idea. 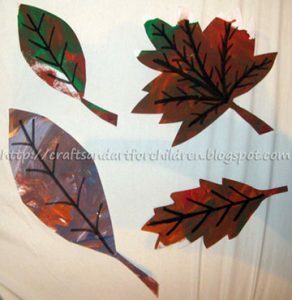 I kept the outer part of the leaves I cut for the above suncatcher craft because it made a nice stencil. 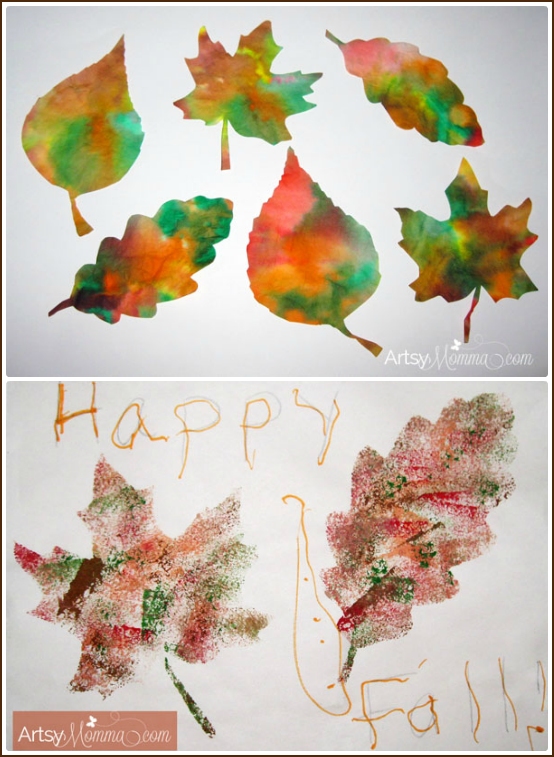 My son picked two of the leaf stencils which I taped to a piece of paper. 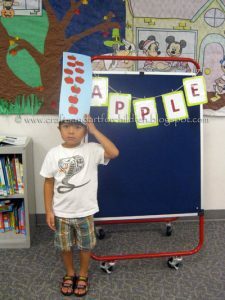 Masking tape works best for this because most easily can be pulled off without ripping. I gave him a sponge and a plate with small blobs of paint on it in fall colors. 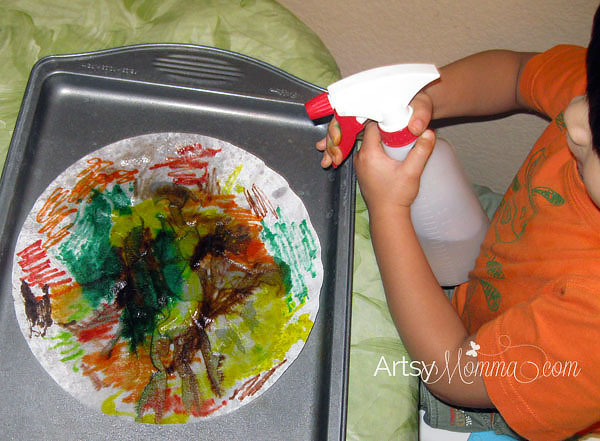 Make sure to have your child gently blot off excess paint onto another sheet of paper or a different area of the plate before dabbing them inside the leaves. 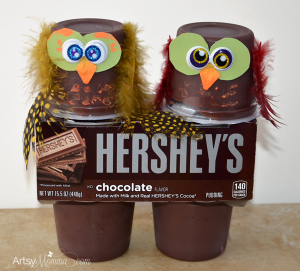 Create a textured look by stamping layers of different colored paints. Finished sponge painted leaf art, ready to be hung up on the refrigerator. 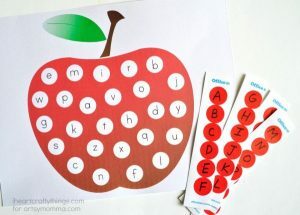 Help prewriters practice letter formation by lightly writing ‘Happy Fall!’ with pencil. Have them trace over it with a marker. 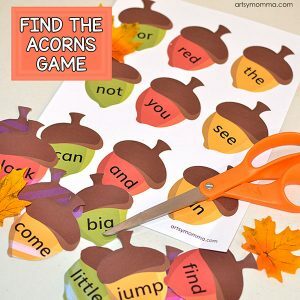 If doing this fall leaf project with a toddler, you could place your hand over theirs to guide them, saying the name of each letter as you write it. 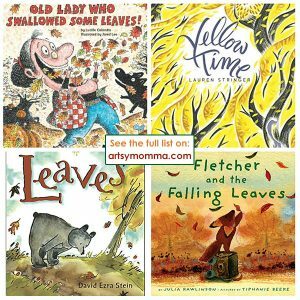 These Fall leaf projects are perfect for budding artists because they are open-ended enough to allow them to freely explore and observe what happens. 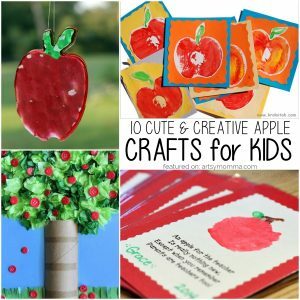 Yet, they can still have an end result to inspire them, ignite their imagination, and have the proud smile little ones often have after creating something they recognize. 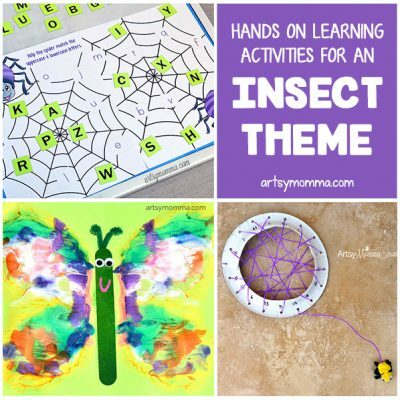 Handprint Leaf – Includes a fun song! 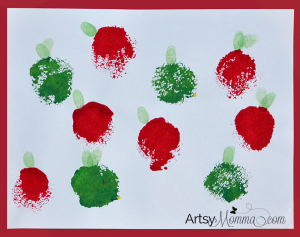 Make as part of a handprint calendar or as a separate craft. 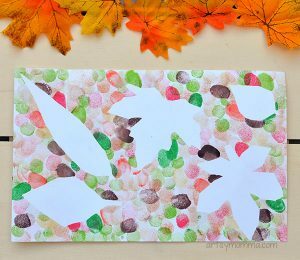 Leaf Silhouette Art Project – Made with fingerprints, I LOVE how this turned out! 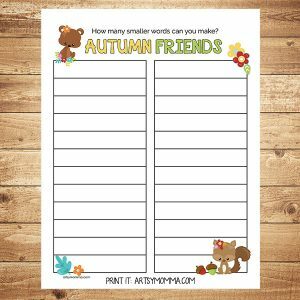 Welcome Fall Sign – Fun fall decoration to hang on the door! 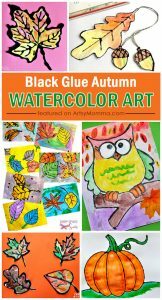 Watercolor Fall Wreath – Love this idea! 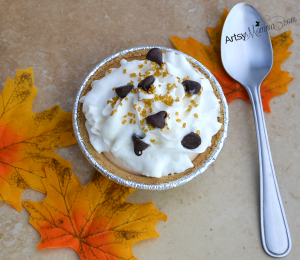 « You Will Love How Easy These Apple Cookie Pops Are To Make! the suncatchers are so pretty! thanks for popping by my blog the other day. i&#39;m following you now. I love these beautiful suncatchers and sponge painted leaves. They really capture the Fall season.